Not 100% sure since TV/Phone/Internet is all bundled in one. It's around $238/month for the bundle. $20 or so of that is just home phone though. 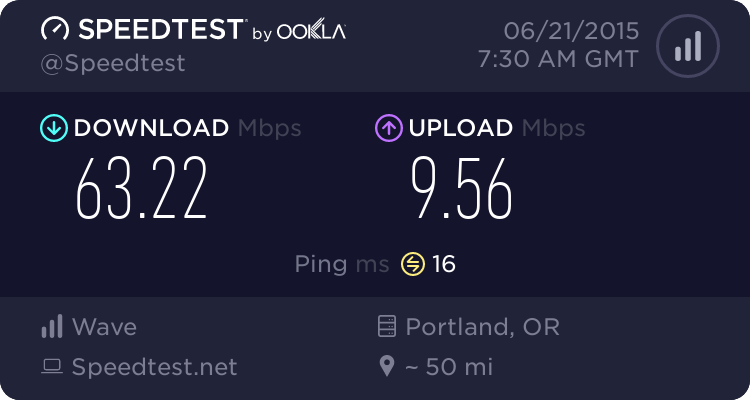 I pay for 100 Mbps down and get 112-115 so it's not bad. Although I'm not getting the 20 Mbps upload I'm supposed to be paying for. Might have to complain . Edited by KB24, January 28, 2014 - 09:33 PM. ^ You should. It's within your right. Find out why the [expletive] they're laggin' it there. TWC now 3x faster depending on one's area. Apparently I'm eligible for the upgrade. How I barely found out about this when it seems it's been out for some time is a little disappointing to say the least, but better late than never. Working to get my equipment upgraded so I can feel that dramatic difference.